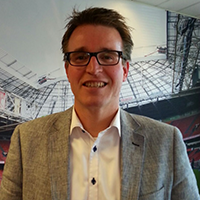 The Amsterdam ArenA will be the first stadium in the world where HighTech solutions are used to monitor and maintain the health of the turf grass. A system consisting out of precise sensors will continuously monitor the natural turf grass itself and its environment. By interpreting the effect which the measured factors will have on the turf grass, we intend to eventually optimize the grass cultivation strategy in order to grow “top quality grass. For now the ArenA will be a field lab which will help us to control the vitality of the turf grass. By the knowledge we gain architects will be able to design stadia in optimal conditions to remain optimal turf grass conditions.